"I am a hostage and a prisoner, imprisoned by my handicap," one survivor said. Angelica Caye Kuhn was on the road to becoming a nurse. The mother of two was working as a patient care technician nearly two decades ago when one day she heard a pop in her back. She was in pain for days and, after several tests, she was diagnosed with Spina Bifida, a spinal cord defect common in children of male Vietnam veterans who were exposed to Agent Orange. 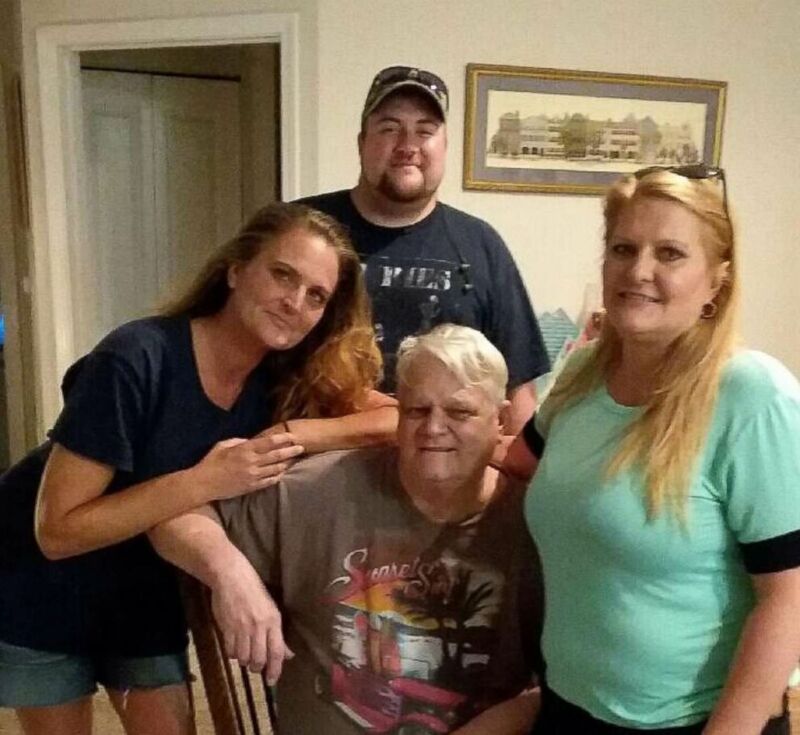 The daughter of a combat Vietnam veteran who served in 1969 until 1970 in areas that were the most heavily sprayed with Agent Orange, Kuhn said most of her life she struggled with neurogenic stomach and bowel issues that were often misdiagnosed. Her father years later would later be diagnosed with several heart conditions and diabetes all related to Agent Orange exposure. (Angelica Caye Kuhn) Angelica Caye Kuhn, right, is seen with her father, David LeRoy, center bottom, Brother David LeRoy and sister Melissa LeRoy in this undated photo. Kuhn eventually received her nursing license and went back to work, but her career was short-lived. Since then, she has had 28 different surgeries and is now legally disabled. "I am a hostage and a prisoner," she wrote in an email to ABC News. "Imprisoned by my handicap. All because of a KNOWN toxic chemical that was dumped on my unsuspecting father and millions of other unsuspecting members of our military, who have/are paying with their lives and the lives of their children!!!" More than 40 years after the end of the Vietnam War, children of the men and women who served say they are battling a new war for benefits as they grapple with the impact of toxic exposure which has wreaked havoc on their lives. Agent Orange is a term that is used to describe a series of odorless herbicides that were used by the military to defoliate hiding places, fields and rice paddies that were used by the Viet Cong for survival. Almost 20 million gallons of Agent Orange was sprayed in Vietnam, according to the Department of Veterans Affairs. The chemical was also used at several U.S. military posts in America, Southeast Asia, and Canada, according to the agency. 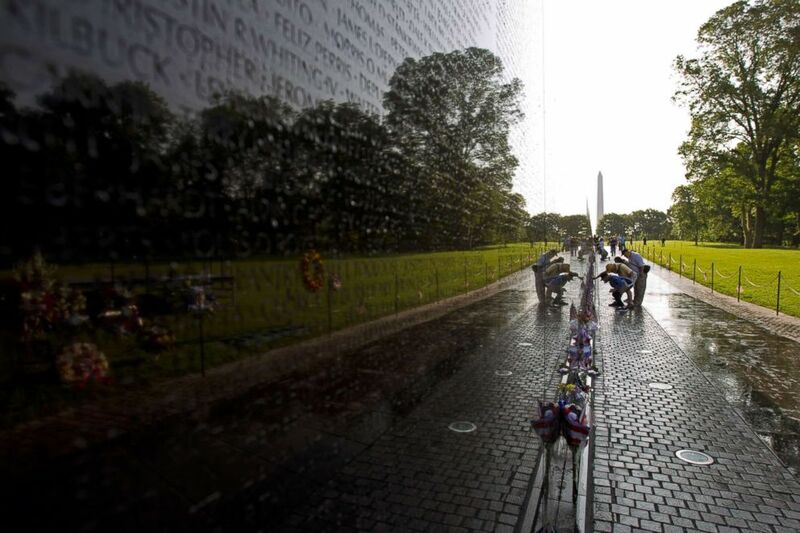 (Jose Luis Magana/AFP/Getty Images) Visitor looks the names on the wall of the Vietnam Veterans Memorial in Washington DC, May 28, 2017. Earlier this year, the agency recognized publicly for the first time that some service members were exposed to dioxin because C-123’s that were used to spray the Agent Orange was still being used by the Air Force and Air Force reserves in the U.S. until 1986. Five years after the C-123’s were taken out of service, "The Agent Orange Act" passed in Congress allowing returning men and women to receive medical compensation for their illnesses. The VA declared specific conditions ranging from diabetes to cancer, directly tied to presumptive exposure to Agent Orange and dioxin. The VA did not respond to ABC News' multiple requests for comment. In 2017, Rep. Barbara Lee, D-Calif., introduced legislation in Congress to allow the VA to recognize more medical conditions from children and grandchildren of male veterans. The bill is still being considered but hasn’t gone to a vote. The Vietnam Veterans of America, a nonprofit, has been advocating for decades for the government to assist veterans with issues as it relates to Agent Orange and has held over 300 town halls on the issue. Their project Faces of Agent Orange focuses on children and grandchildren of both male and female veterans with filing claims with the VA. The group says they are attempting to help the government have an accurate database on the long-term effects of the chemical exposure. “You can't review science that doesn't exist and nobody was funding the science on the children the grandchildren,” said Mokie Porter, the communications director for the Vietnam Veterans of America. On Wednesday, the U.S. announced that it had completed a clean up the dioxin saturated soil the area surrounding Da Nang Airport, an area heavily sprayed with Agent Orange according to Vietnamese and American officials. And in October, Secretary of Defense Jim Mattis traveled to Vietnam to visit Bien Hoa Air Base a spot that is undergoing a $390 million soil restoration project headed by U.S. Agency for International Development. The Vietnamese claim that 4 million people were exposed to Agent Orange and 3 million of its people suffer from medical conditions that were caused by the exposure from the Vietnam War. Despite the efforts to decontaminate the soil, the U.S. vehemently denies that the number of Agent Orange illnesses are that high, which according to the Vietnamese includes children of men and women who were exposed to the dioxin following the war. Betty Mekdeci, the executive director of Birth Defect Research for Children, a Florida-based non-profit says she’s collected data since 1986 on birth defects from toxic exposure. Because more men served in Vietnam, Mekdeci says she has received more data specifically showing birth defects in the descendants of male veterans. Her organization has collected data from nearly 10,000 veterans, 2,000 children of Vietnam veterans and 300 grandchildren of veterans. Many of the medical conditions she’s seen in grandchildren of veterans aren’t physical. Mekdeci says she’s seen issues with ovaries, endocrine, learning and attention deficit disorders and cancer. “We don't have ten years to look at these things. These kids are having problems right now and we need to get on it right now not ten years from now.” She says that the scientific community should focus on assisting children of veterans instead of studying them. 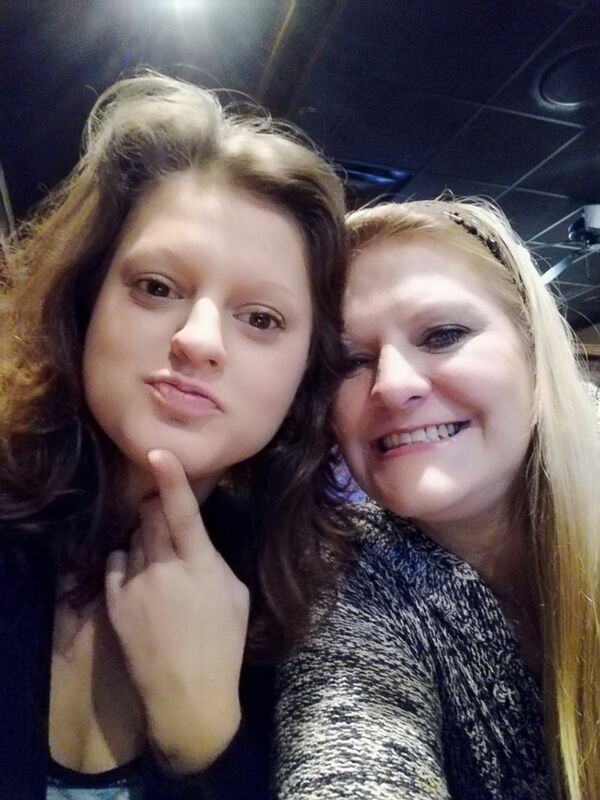 (Angelica Caye Kuhn) Angelica Caye Kuhn is seen with her daughter, Lauren Kuhn, left, in this undated photo. Kuhn said she applied for VA benefits in 2000 and was granted only partial benefits. She appealed the VA’s decision saying that she met the criteria and was legally disabled. Kuhn says after a call to the Denver VA office of Spina Bifida, a VA employee asked if she was able to feed herself. Kuhn says after replied, yes, she says the VA employee said since she could feed herself, she didn’t need any additional help from them. Kuhn says she has appealed the VA’s ruling and has successfully won twice but has been denied seven years of back pay. Kuhn said she often relies on wheelchairs and canes to move around and because her husband works to support her family she is often alone at home. She says the VA has denied her request pay for a stair lift so she can be mobile in their two-story home and has denied her request for hand controls so she can drive her car. Kuhn says that although she is entitled to VA social worker due to her condition, she has yet to receive one and currently doesn’t have a home health aid despite numerous requests. Kuhn’s family members say they have also suffered medical problems. Her mother developed a rare blood condition and was diagnosed with a toxic liver. And Kuhn's daughter suffers from a connective tissue disorder. Under the VA guidelines, Kuhn’s daughter would not be covered for VA benefits because her grandfather was a male veteran who served in Vietnam. Dr. Kenneth Ramos, the chairman of 2014 Congressionally mandated report by the National Academies of Sciences, Engineering, and Medicine on Veterans and Agent Orange, says that the majority of the generational studies done by the scientific community regarding agent orange has been focused on women and not men. Ramos says that changes in technology will help answer questions on transgenerational inheritance. But it won’t answer all of the questions right away. “The biggest challenge that you face with current generational inheritance is the length of time that it takes for you to see the facts,” he said in order to fully study the impact on future generations research would have to be started from scratch. Dr. Michael Skinner, with Washington State University’s Center for Reproductive biology, has studied the transgenerational health effects of dioxin exposure using animals and says women who served in Vietnam and was exposed to Agent Orange could have passed the dioxin to children for at least 15 to 20 years after they returned home. He also says through his research he’s seen dioxin passed through sperm to the offspring in animals. His concern is not with the veterans who returned home or their children, but with their grandchildren. “We have examples where there is no disease in the first generation but there's huge numbers of disease and the third generation,” he said. On Thursday, the National Academies of Sciences, Engineering, and Medicine will release their report as a part of the congressionally mandated biennial reviews of the evidence of health problems that may be linked to exposure to Agent Orange and other herbicides used during the Vietnam War. The report will address “possible generational health effects that may be the result of herbicide exposure among male Vietnam veterans” according to the organization. The Vietnam Veterans of America, however, says regardless of the outcome of the report they will continue to educate and advocate for its members and their descendants. In the meantime, Kuhn said she'll continue to push for awareness. "It's been a nightmare," Kuhn said and vowed to continue fighting for awareness. "You have to fight them because if you don't they will run over you big time and a lot of people you know they just give up and walk away and you can't do that."